Lexus has slashed prices for its largest vehicle. Those looking for the most luxurious large vehicle for on and off road, as well as towing now have a very hard choice to make. The Lexus GX 460 is updated for 2014 and today Lexus announced the prices for the model. The GX 460 is the three-row, body-on frame, full size luxury SUV from Lexus. It can transport five to seven passengers in the utmost comfort, and it can also serve as a luxury towing and off-road beast. The prices announced today make the 2014 GX 460 look very attractive when compared to such competitors as Land Rover and the Cadillac Escalade. The new GX 460 features the new Lexus look including the front “spindle” grill. LED lighting is now standard and optional lighting includes LED driving lights as well. Daytime running lights are standard. The new infotainment screen is a full 8 inches diagonally, and the HD radio includes complimentary real-time weather and traffic. The new 2014 GX 460 is offered in Base and Luxury. Base has an MSRP of $ 49,085 – ten percent less than last year. The new value spot is the Premium Package which can now be had for the same price as the base priced 2013 model. Included in this package, which almost all vehicles shipped to dealerships will have, are Navigation, perforated leather, three zone climate control, heated rear seats and Parking Assist. The Luxury version of the GX 460 starts at $ 60,715, but it includes Navigation, Adaptable Air Suspension, Blind Spot Monitor with Rear Cross Traffic Alert, Intuitive Parking Assist, and 18-inch liquid graphite finish alloy rims. The Lexus GX 460 has all manner of off-road equipment as well as quite good on-road manners. 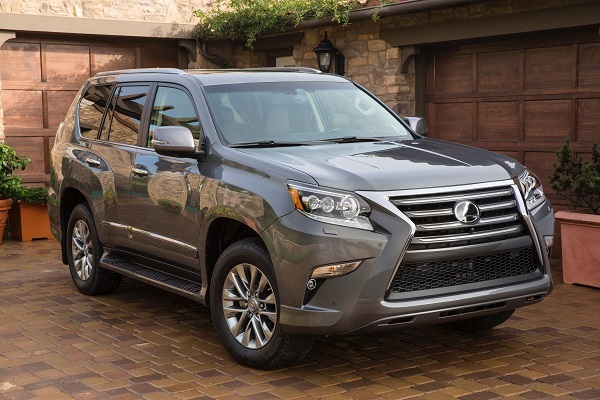 In our recent review, writer Don Bain nailed the value proposition of the Lexus GS saying the Lexus would be a good option to “Protect the Queen for $16 less.” He was referring to the fact that the Lexus GX 460 has the elements of a Land Rover Range Rover, but is priced lower. Add to that the incredible disparity between Lexus and Land Rover over the past 10 years in terms of quality and Lexus makes sense to anyone not trying to impress the paparazzi. The Lexus is also a real value compared to the Cadillac Escalade which has prices ranging from $ 67,970 to well into the mid $80K range. Other options from this brand might now include a Toyota Highlander, which for 2014 will grow in almost every way and can be configured to have eight seats, or seat seven with the middle row being very comfortable captain’s chairs. The Highlander will not be as capable off-road, but as a people mover, it will become the brand’s biggest vehicle in terms of passenger capability. It will also have dramatically better fuel economy with similar acceleration.